Spend 15 minutes a day in reflection — true reflection, in a quiet space, with your inbox closed. Take this time to review the events of the previous day and make plans for the one coming up. At the end of every week, run the same exercise for an hour and review the entire week. Why do all of this? Reflecting accelerates learning. Focus on three things: hire the right people, don’t run out of money, always have a North Star. That’s all. People. Cash. Mission. The Big Idea: the most successful men are usually the most humble. They read and study constantly because they know there is much they do not know. Michael Jordan was cocky but immensely coachable. Sam Walton spent incredible amounts of time in his competitors stores => humility. The humble man reads more books because he understands there is more to learn. Sam Walton got arrested for crawling on the floors of Brazilian stores trying to learn new things. Sam Walton tried to learn something from everyone. Everyone wants the good life, but not everyone is humble enough to get the good life. Jeff Bezos was obsessed with Sam Walton. Jeff Bezos carries a notebook everywhere he went. When you meet with people, how many pages of notes do you take. Warren Buffett started at 7 reading every book on finance in every library in Omaha. Every great man in history had a mentor. Read books, have mentors, study competitors, spend money on learning. Your time on earth is finite, time is the most precious resource so guard it carefully. Read the same great books over and over and over. Bezos practically memorized Sam Walton’s book Made in America. Bezos walked around with a notebook and learned constantly. Fear and childhood trauma can prevent authentic humility. I read in the Amazon reviews that Oren Klaff is the Neil Strauss of Wall Street. That comparison makes a lot of sense. I really liked this book. My notes are below. Pitching may be the most important thing we do. Q: How does the crocodile brain think? Q: How do you engage the crocodile brain? The stronger frame absorbs the weaker frame. If your frame wins, you enjoy frame control and your ideas are followed. Traditional sales tactics were created for people who have already lost the frame collision and are struggling to do business from a low status position. If you have to explain your authority, power, position, leverage, or advantage, you do not hold the stronger frame. Frame collisions are primal. They freeze out the neocortex and bring the crocodile brain in to make decisions. Weak arguments, made up of logical discussions and facts, just bounce off strong frames. Three frames you will meet: power frame, time frame, analyst frame. Four responses to frames: power-busting frame, time-constraining frame, intrigue frame, and prize frame. The power frame is the classic frame in business. Don’t reinforce the power frame by accepting the beta role. Instead, instigate a power frame collision: 1) perpetrate a small denial or 2) act out some type of defiance, usually with light humor. Stay in control of time. Running long or beyond the point of attention shows weakness, neediness, and desperation. When you feel attention drifting away, set your own time constraint, and bounce out of there. The response to an analyst frame (digging into the technical/financial details prematurely) is to use the intrigue frame. First respond with summary data. Then refocus on the relationship. “The revenue is X and the profit is Y. These and other facts you can verify later, but right now what we need to focus on is: are we a good fit? Should we be doing business together?” Then invoke the intrigue frame by sharing a narrative. People will pay attention only to the point where they realize that they understand everything you are saying and you have nothing new to add. 1. We chase that which moves away from us. 2. We want what we cannot have. 3. We only place value on things that are difficult to obtain. In most cases, you enter a new business setting with a low status position. Status can depend greatly on context. A french waiter can have higher status in a restaurant than a business executive. A golf pro can have higher status on the golf course than a surgeon. Having alpha status in the room makes every interaction easier. Beta traps are such things as waiting in the lobby, waiting in the conference room, filling out an application, and getting a guest name badge. They reinforce the existing status differential and benefit only the higher status person. If you wish to elevate your social status, redirect people to a domain in which you are an expert. This is called local star power. Genuinely enjoy your work. Having fun means instant social status and stronger frames. Establishing a prize frame increases your own social status. Finally, confirm your alpha status by playfully making the other party make a statement that confirms your higher status. “Remind me again why I would want to do business with you.” Even if it is obvious and you are being sarcastic. When pitching, always start off by saying that you’ll be brief. It will put the audience at ease. Use the idea introduction pattern: For [target customer] who are dissatisfied with [current offering] my idea is a [new product or service] that provides [key problem/solution features] unlike [competitive offering] my idea is [describe key features]. Tune your level of detail to the other person’s mind. 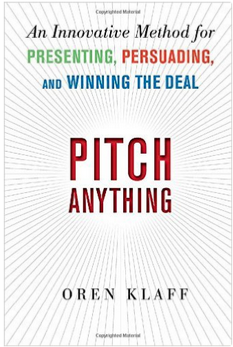 A pitch narrative is a series of tension loops. Push then pull. Create tension. Then resolve it. Delivering the core of the pitch is straightforward. Package the information for the crocodile brain. Big picture. High contrast. Visual. Novel. With verified evidence. Be different by discussing the budget first. Most startups overestimate revenue and overestimate costs. Discuss your secret sauce, your unfair advantage. 3. Offer the deal: Tell them exactly what the deal is. And do this quickly so you can move to phase 4, stacking frames. People think they decide things rationally (slow thinking) but more often people decide things emotionally (fast thinking). We justify decisions after we’ve already decided. You want to create hot cognition (emotional decisions) by stacking frames. Frames you can use to create hot cognition: intrigue frame, prize frame, time frame, moral authority frame. Intrigue frame: tell a narrative with the classic pattern: put a man in the jungle, have beasts attack him, get the man to the edge of the jungle but don’t save him, will he get to safety? No pitch is going to get to the logic center of the brain without passing through the crocodile brain first. Hot cognition is fast. Cold cognition takes hours or days. Showing signs of neediness is about the worst thing you can do to a pitch. Neediness triggers fear, uncertainty, and avoidance. Constant self-talk up to and during your pitch: I don’t need these people. They need me. I am the prize.